When Rick and I first met we had lunch at a little pub right beside the river where our home dock now is. After lunch we walked down to the docks to look around. It was a sunny clear February day and the dock lines were frozen and the air was crisp and cold. A year and a half later in June, we were married. Rick had the Fish-N-Chips moored in Richmond at the time – much closer to the ocean for weekend escapes. The Fish-N-Chips was relocated to Mission at the Mission Harbour docks. 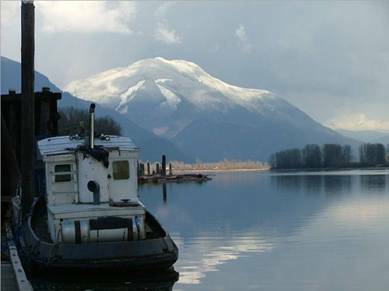 I sold my house in Mission and I found myself living on a 34 foot boat in the Fraser River. We arrived home from our two month honeymoon cruise in September 2003. We called ahead and asked if there was any room at the dock for us. We were told by the Harbour Master, Janet Gunson, that they were full but something might come available soon. We anchored across the river from the docks and took our tender back and forth to land at the dock for four days. After four days Janet felt sorry for us and told us to come over and tie up at the breakwater dock. After two months we were on the inside and enjoying our new home. We have since moved our boat to the inside of the breakwater dock. We enjoy a beautiful view of the river and the mountains. The birds and wildlife also make our home very scenic. It is not uncommon to see eagles, blue herons, beavers, seals, many varieties of gulls, depending on the time of year, and river otters as well. The coming and going of weekend fishing boats, jet boats, guide boats and the working tugs in the area make for never a dull moment on the river. We enjoy a “gated community” where the gates are locked from 1800 to 0800 each day. There are currently four live-a-boards on the dock which also aids in security. Water and 20 amp power outlets are also available. 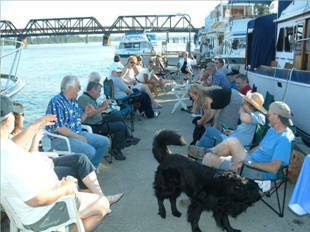 In late spring before people move off for summer cruises we usually have a dock party and get everyone together at the same time to chat it up about their boating experiences and future cruising plans. My first two winters on the dock were extraordinary. The first year, 2003, the river froze over, something that hadn’t happened for over 12 years. We had just returned from a two week Christmas cruise in the Gulf Islands when we came up the river and had to break through a thin crust of ice to get home. Once we were docked the night turned even colder and by morning we were frozen all around. 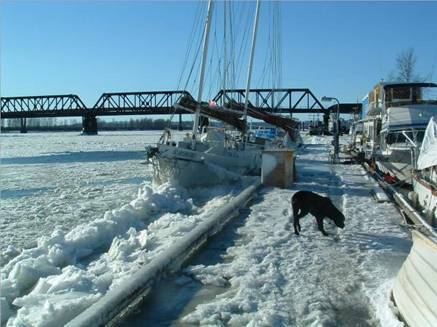 For one week you could walk around the docks safely with ice eight inches thick around the boats. The ice covered the river from one side to the other but the water was still moving underneath. Small icebergs slid down the river and bumped into other “bergs” giving the river a real “bumpy” look. After one week the weather warmed up and the ice flowed slowly away. The downside to living this far up the river is the time it takes to get to the ocean. When we go out it is at Christmas, Spring break and two months in the summer. 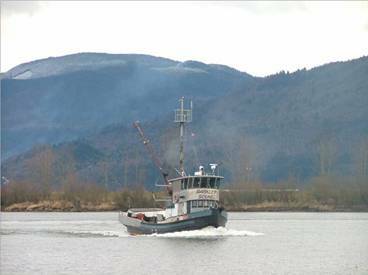 It takes us about six hours to get to the ocean going with the flow of the river where we usually stay over night either in Cowards Cove in the North Arm of the river or Steveston in the South Arm. On our return from the ocean, after crossing the Strait of Georgia, we usually stop at one of the two locations where the river meets the sea and the next day go as far as the Pitt River and tie up at the Gill Netter Pub docks. Once you get past the Port Mann Bridge the river is much quieter and you don’t have to be on guard for barges and huge tankers and cargo ships. 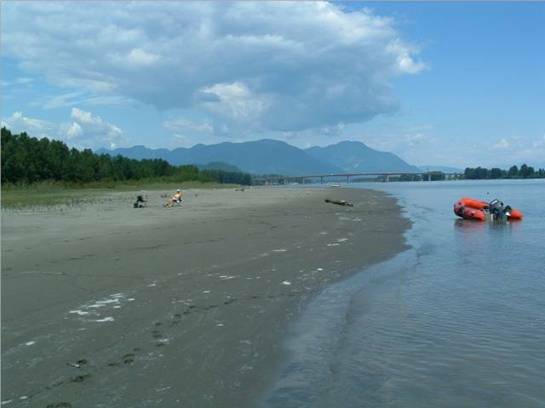 If we do weekend trips it might be to Fort Langley to tie up for the weekend and if we have a four day weekend in the spring we can make away for Pitt Lake which seems as large as the ocean. If we just want to get away and have some quiet time we can go just an hour down the river and anchor behind some of the small islands and enjoy the scenery from there. We often take friends and colleagues out on the river for day cruises in the late spring and early summer before we take off. If we have some really warm days we also like to go out in our tender, Catch-Up, and putt up the river where the water is too shallow for our bigger boat. Later in the spring when the current in the river isn’t too strong we can also kayak around home a bit as well. If the river is too difficult to paddle in we take the kayaks behind us in the Catch-Up and tow them up river to the slough and paddle in the more protected waters there. The Catch-Up is tied to a dolphin in the slough and we jump in our kayaks and explore the slough and its wildlife.